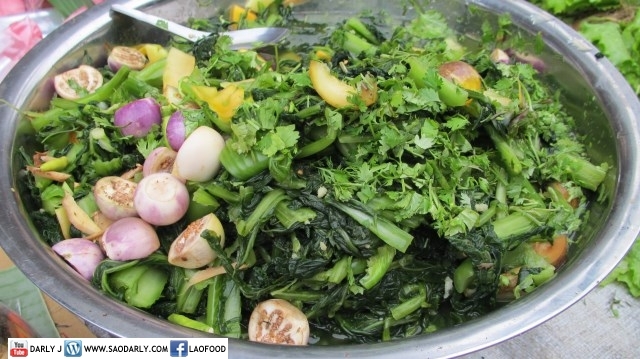 Som Phak Kard (pickled mustard green) at the Morning Market in Luang Prabang, Laos. I was buying some fruits to take on the bus ride to Vang Vieng when I saw a lady selling the pickled mustard green. There were so many people gathered around her big tray of pickled fish and bowl of pickled mustard green that I couldn’t get a closer look. 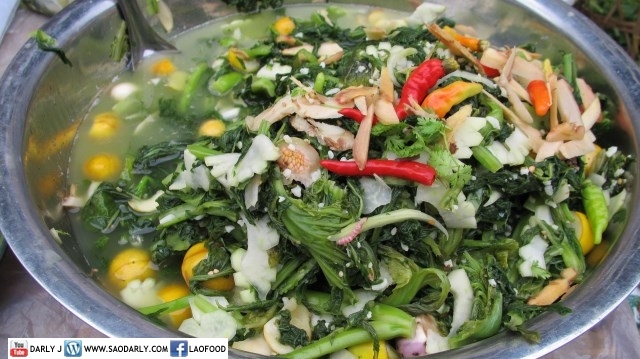 The pickled mustard green looks delicious with the small round aubergines (green eggplants). If I was staying in Luang Prabang a day longer then I would buy a bag of Som Phak Kard and a grilled fish to eat with warm sticky rice and Jeow Bong.